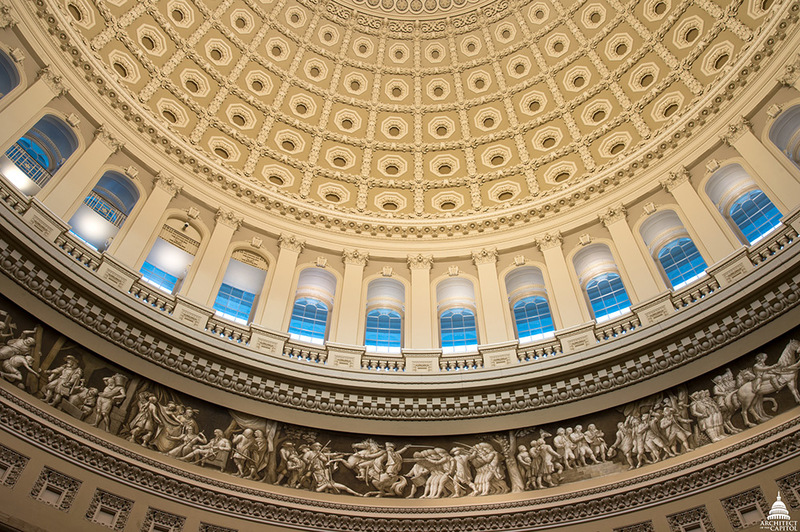 The Rotunda of the United States Capitol has long been considered the most suitable place for the nation to pay final tribute to its most eminent citizens. On Wednesday, February 28, 2018, the late Reverend Billy Graham will be brought to the U.S. Capitol to lie in honor. With this distinction, Graham joins a handful of individuals previously honored in the Capitol Rotunda during its nearly 200-year history. Rev. 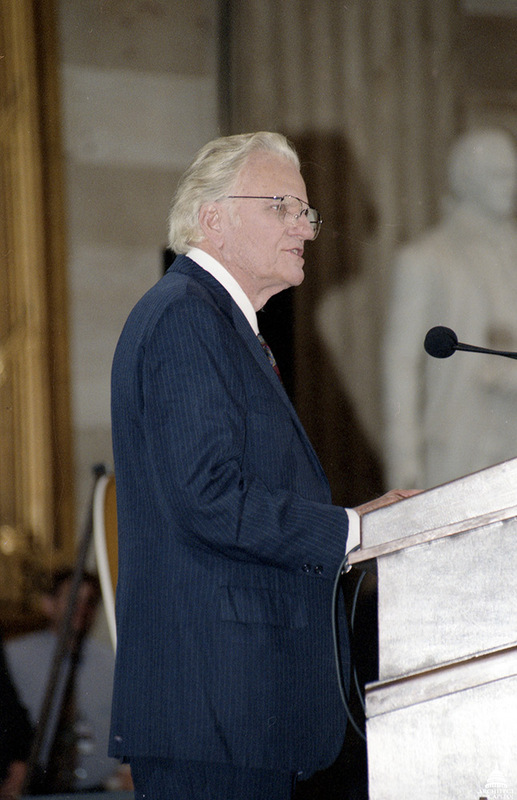 Billy Graham giving remarks in the U.S Capitol Rotunda in 1996. The occasion calls for coordination across the Capitol campus, and the solemnity of the event requires a commitment to excellence to ensure no detail is overlooked. Once the casket arrives at the U.S. Capitol, the AOC works with care behind the scenes to ensure the ceremony is successful and seamless to the attendees and the viewing public. Following the formal ceremony, the AOC rearranges the Rotunda to provide the public with an opportunity to pay their respects. Looking up in the U.S. Capitol Rotunda. Once the public viewing concludes and the casket is removed from the Rotunda, the AOC reopens the building for public tours. Lying in Honor (for prominent citizens) or Lying in State (for military or government officials) are historic events and, for many, an important part of the grieving process following the loss of a person who made a significant impact on the country. It is an incredible honor to prepare the Rotunda for this momentous occasion and know the eyes of the nation and the world will be upon us. We are proud to be a part of history. Rev. Billy Graham, the beloved pastor of the world, is now in his heavenly home and was welcomed by his Lord and Savor Jesus Christ. It is only fitting that he has received such an honor to lie in state in the US Capital Rotunda. My prayers are with his family and all Americans who loved him. The Architect's Office did a wonderful job, as the ceremony was a beautiful tribute and everything looked very good. It was nice of Congress to honor Rev. Graham in this manner and the presentations certainly speak to the spiritual basis of our country. Nice job by all and thank you from this grateful American. I'm thankful and pleased that his country saw fit to honor Billy Graham in this remarkable way. He lived his long life to always honor and glorify the Lord Jesus Christ. I am certain his Lord gave him a great welcome to heaven. Earth is lessened by his passing, but heaven is increased.